To learn more about past or upcoming Art Walks for Strollers, please contact Catherine Pulkinghorn at catherine@artistswalkinghome.ca or at 778 709 2075. In partnership with the Roundhouse Community Centre, last autumn Catherine piloted a series of walks for parents and caregivers of kids in strollers. These adult participants are generally already walkers in their neighbourhood – many getting out daily on the seawall with the kids for exercise and fresh air, as well as doing local errands, and attending parent/caregiver and tot activities at the Roundhouse. During the walks, Catherine was surprised to realize that many of the new parents are often also very new to the neighbourhood. We explored Yaletown historic sites and artifacts, interpreted the many public art pieces we visited, and discussed the urban master plan of the area, pointing out public amenities and resources. We talked together about how living in apartment buildings can make it difficult to meet people, and how during the walk our perspectives had changed with new neighbourhood facts, and our experience together. Participants were happy to meet new friends with similar personal situations, as well learn new ways of navigating and understanding the neighbourhood. A primary motivation for Catherine is to expose special local sites and public art to parents and caregivers, so as their children grow, they can in turn share this knowledge with the kids. 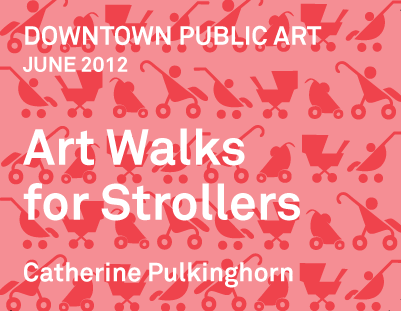 We are pleased Catherine is going to carry on providing monthly Art Walks for Strollers in Yaletown throughout 2012. Please click here for more information.